That innocuous looking little fella above is proving to be quite a handy companion for my iPad mini. 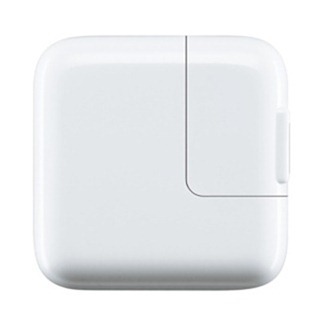 It’s an Apple 12W USB Power Adapter. I use it in tandem with the Lightning to USB cable that came with the iPad mini and I’m seeing very quick charge times with it. When I let the iPad mini run all the way down until it powers down automatically, I can get it charged from zero to 100% in under 3 hours. I’ve done this a number of times and consistently seen it take around 2 hours and 45 – 55 minutes. That feels pretty fast to me – especially as I’ve seen some people online mentioning 5 and 6 hour charge times for their iPad minis. I’m feeling like the $19 investment in the 12W power adapter was well worthwhile. For those of you with iPad minis, how fast is your charging typically? Are you using a 12W adapter? thanks for this blog, Im deffinitely buying this for my iPad. I will let you know my charging time with it. Bought a 10 W at the local Target and use it to charge my iPad mini, 2 iPod touches and 3 nanos of varying vintage. The 5 W sits in a drawer, never to see the light of day again. It’s a joke. I get similar times from the more powerful charger. one thing to think about… heat is the enemy of rechargeable cells. charging faster creates more heat, which will affect the life of the battery. just how much it cuts the life is the question. I wouldn’t be afraid to use the 12w from time to time in a pinch, but I wouldn’t do it every day. Thanks to the 10w that came with my original iPad, my iPod touches & nanos have only been charged that way. No significant battery deterioration that I can see from the fast charging.